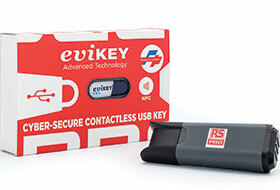 RS Components has introduced a new addition to its high-quality RS Pro range with the launch of the Evikey One NFC cybersecure contactless USB key. The innovative range of USB flash-drives delivers a high level of security for important data by enabling users to lock and unlock the drive using their smartphone, essentially as an electronic key. The range incorporates a standalone cyber-security device called the ‘Contactless Padlock Self Sufficient’, which generates electrical power to operate the ‘Fullsecure’ system. This energy is gained from the signal produced by the NFC antenna from NFC readers, in particular NFC powered smartphones, tablets or other smart consumer devices, in conjunction with an app running on the smartphone. Because it is autonomous in electrical energy, the key can be administered and unlocked without it being connected to an external power source, such as via its USB interface. In addition, the devices are simple to use, as they require no installation of software or drivers on host computers. In addition to being waterproof, other features of the flash drive include: TLC (triple-level-cell) flash memory; four embedded electronic security levels; and compatibility with Android 2.3.3 and higher, and with USB 1.0, 2.0, 3.0 OTG. Eight models are available with a range of memory capacities, including 8, 16, 32, 64 and 128 GB.